Many people show an excessive or uneven amount of gum tissue when they smile. Having a disproportionate amount of gum tissue can detract greatly from an otherwise great looking smile. With the technology available today, a "gummy smile" is no longer an obstacle for achieving a beautiful smile. What causes a "gummy smile"? A variety of factors such as genetics, certain medications and poor oral health can cause can cause an overgrowth or asymmetry in gum tissue. In many instances the gum tissue can dominate the smile and take the focus off of the teeth. In order to correct a gummy smile, Dr. Badolato uses a soft tissue like an artist would use a paint brush. The laser reshapes the position and structural composition of the gum tissue by literally vaporizing the unwanted gum tissue. The procedure is very simple and requires very little anesthetic. Patients can return their daily activities immediately. A full recovery can be achieved in just a few days. The soft tissue laser can be and is used in many different ways at Studio B. 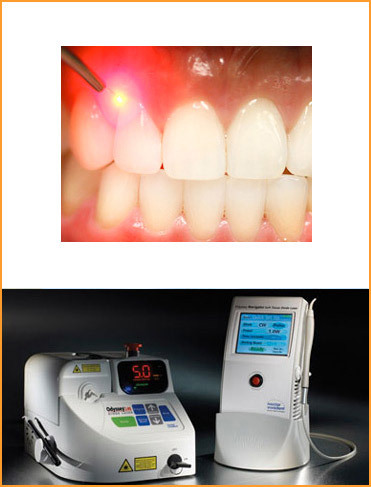 This laser is used most frequently in our Smile Makeovers. By using the soft tissue laser, Dr. Badolato can remove excess gum tissue and reshape the gums to achieve a more symmetrical and aesthetic look. The soft tissue laser can also be used to help treat periodontal disease or other poor oral health conditions by removing tissue that traps bacteria around the teeth. Additionally, many oral lesions or ulcers can be treated with the laser in order to eliminate pain and speed recovery. If you would like more information about Laser Gum Recontouring or would like to schedule an appointment to see if you are a candidate for Laser Gum Recontouring, please call our office at 480-860-0092.